Ambush Valley is the third supplement for the Force on Force rules for modern warfare, which were published in 2011, and is actually the second edition of this supplement – the first being solely published by Ambush Alley games in 2009. Section 2 contains new or modified rules for Force on Force. These include notes on terrain (such as paddy fields), different rules for off-board artillery, notes on air support and a section on riverine craft. Following this, there is a brief section giving an introduction to the Vietnam War, its background and history. The meat of the book (almost 90 pages) is taken up with a section on unit organisations. This looks at all the main protagonists of the war, and goes into some detail on each on not only platoon & company organisation, but also historical notes on unit operations and how they developed during the conflict. Everything you would expect to find is here: US Army & Marines, Armoured Cavalry, Air Cavalry, Armoured Units, ARVN, other Free World force and a dozen Special Operations units plus PAVN, PLAF and VC. The next section of the book looks at the conflict in Laos and Cambodia, again giving brief historical backgrounds and details of unit organisations. The next sections give some notes on Vehicle stats for the game, there is a selection of 6 scenarios, and the book rounds off with a section on solo and co-op gaming, where the VC force is run by a series of action tables, rather than a flesh & blood opponent. At the end of the book is a selection of period specific Fog of War cards, which can be cut out and used in the game. The book, as you may expect from Osprey, is very well produced and laid out, with photos and illustrations appearing on every third or fourth page. The illustrations will be familiar to anyone who owns any of Osprey’s books on the Vietnam War, although the miniatures photos are new. Unlike the previous supplements in this series, this book spends much more of its content examining unit organisations and giving historical notes on these, rather than on scenarios. This book only contains 6 scenarios, whereas the other Force on Force supplements each have 20+. Also, those 6 scenarios are not what you would call ‘typical’ – of the 6, 3 concern VC raids on US or CIDG Firebases, and two others are urban fire fights. There are no scenarios using Armoured Cavalry, Airmobile or Riverine operations. The scenarios themselves are well presented, although Osprey have continued to use hand drawn maps to give some sort of ‘flavour’ to scenarios – I’ve noted before that these tend to be too small and can be difficult to read. I find the choice of scenarios somewhat strange and limited, and they don’t give anything like a full flavour of the conflict. 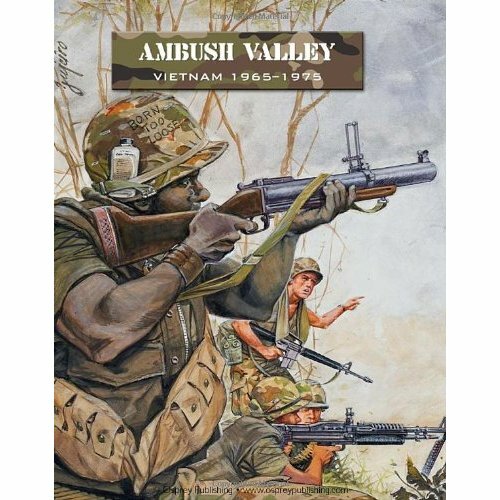 This issue with the scenarios is compounded by the biggest change to the first edition of Ambush Valley – the removal of the campaign system. Most rules covering Vietnam have some sort of campaign system included, as the 12 month ‘Tour of Duty’ implemented by the US forces in particular was so iconic to the period. In the original edition, these rules covered something like 17 pages. Whilst Ambush Valley is certainly the highest page count of all the Force on Force supplements so far, I suspect these additional pages would not have allowed Osprey to keep the same price point. However, keeping these campaign rules, rather than the increased content on Unit Organisations would have been, in my opinion, a much better option. I suspect that most people who game Vietnam have a collection of books containing background material on the forces involved, so the additional historical background for units would only give value to those who are completely new to the period. Far better, perhaps, to include a campaign system and more scenarios? I suppose this does leave the option open for Osprey to publish a second volume on the conflict. I’m a huge fan of gaming the Vietnam War, and so this supplement was very eagerly anticipated. However, it has ultimately left me feeling disappointed. Don’t get me wrong, it’s a very good publication and is an ideal sourcebook for anyone just starting to game the period. However, I would have preferred the book to include the extra content that I have earlier indicated, and would have been happy to pay any extra cover price. Ultimately something of a missed opportunity? I, too, was disappointed by this supplement. It is my least favourite of all the supplement books being the largest one, with the least scenarios. The first edition was better. Agree on all points. The scenarios in 1st edition AV were superior and dropping the campaign system is a big minus. Much of the new stuff is pretty esoteric and not much use to the average gamer. Me2. Most disappointing and filled with stuff I will never use. The few scenarios didn’t even look particularly interesting. One for EBay as far as I’m concerned. Thanks for the review, Neil! I would say that these scenario books are usually very much worth their price. However, this one left me a little underwhelmed as well. For what bascially is a FOF supplement, 6 scenarios in my opinion just don’t cut it. Looking at Cold War Gone Hot, that’s got a lot of information, a huge host of vehicle stats and TO&E of about every possible army involved (ignoring – once again – the Austrian Bundesheer but oh well :p ) and still cram the book full of highly varied scenarios. Especially Vietnam, which – WW2 aside – probably is the most extensively covered conflict on film, could have given them an opportunity for doing film-based scenarios and such like in Cold War Gone Hot. Campaign and solo rules always are great but by your review it doesn’t look like the rules are much more extensive than the ones we get in the rulebook anyway. I’ve just been looking at my copy of Ambush Valley 1st edition and my copy of the Osprey edition of the Force on Force rulebook, and as far as I can tell the campaign rules in the back of the FoF rulebook are almost literally the AV campaign rules with ‘VC’ swapped out with ‘Insurgents’. So if you’re looking for some sweet campaign action just flip to the back of your FoF book and you’re ready to roll! I think 1st ed AV only had 6 or so missions as well. So relative to that it’s not terrible, but compared to the Osprey era FoF books with 20+ scenarios it’s definitely a disappointment. The impression I get is that there were two goals somewhat in tension with AV: a TO&E reference and a gaming supplement. I don’t think it was totally successful in synthesizing the two. For example: it’s neat that they have Thai and Laotian TO&Es but if I want to play them and I can’t remember the special rules for that faction it can be a bit of a hassle to flip through the book and find them. You’re raising some good points there (and I’m a bit disappointed about 1st edition Ambush Valley campaign rules for not being any “deeper”. 😀 ). I think it really boils down to what you’re saying – they set a kind of standard with their other supplements and undermined it with the “new” Ambush Valley. The TO&Es in the FoF supplements are highly useful but maybe they were a little too enthusiastic about the period, had a ton of scenarios and all lying around and wanted to add something “new”? Or, indeed, there’s the plan for a second Ambush Valley book with scenarios and such? I actually like the book as I know only a little about the vietnam war and thought this a great place to start. As I dont own AV version 1 I don’t know what i am missing but I do agree that more scenarios would be nice. That said a scenario pdf for free from osprey might sweeten the deal.